I have always hemmed by hand. When I was growing up, my grandmother was an amazing seamstress, which mean that anything that ever needed to be sewn was completed to perfection by her. I would help out with finishing and any hand-sewing, and so I have always blind hemmed garments and even full curtains for myself and others by hand. But as we are re-decorating at the moment and have many metres of curtaining that need replacing I wanted a quick and simple alternative. I wanted a deep hem to help with the drop of the curtain and so wanted to machine stitch them without a solid stitch line. I knew that you could blind hem with a sewing machine, but though I had looked to trying a few times previously the only instructions I could find were confusing, so after a good deal of searching, reading, videos and pictures I gave it a go, and it worked. I decided to put my own tutorial together as many of the instructions I could find in books and online weren’t comprehensive enough to compensate for what at first seemed like counter-intuitive instructions. 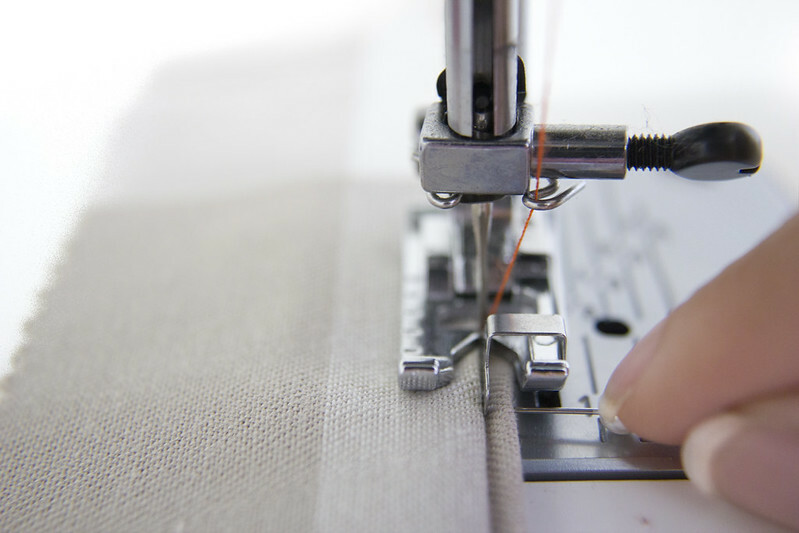 The first thing you need to do to achieve a nice, neat finish is to get your hem prepared. I like to make sure that my hems are folded and neatly pressed flat before I begin, to ensure that the fabric folds stay crisp and in place. It is totally up to you how you treat your hem. You can zig-zag stitch your raw edge if that is your preference, and this can be a particularly good way of dealing with hems on very light fabrics, but as I was sewing curtains from heavy upholstery-weight fabric I decided to fold my hem under itself to neaten it, before ironing the hem flat, as above. 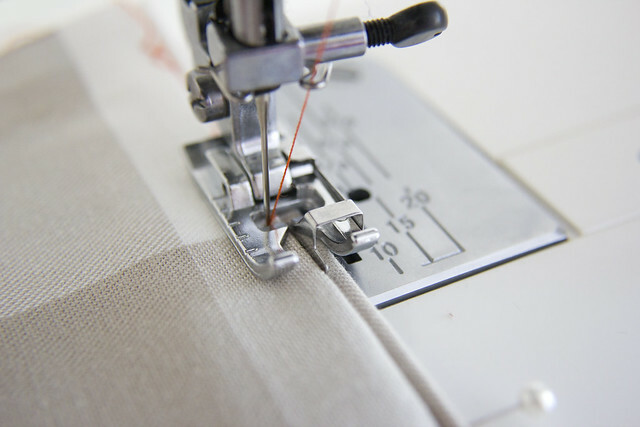 Keeping your fabric with the hemmed edge at the top and wrong side of the fabric facing, start inserting your pins. If you insert your pins as shown above, it will make removing them when it comes to sewing the hem far, far easier. Insert the pins about 2mm (1/12″) from the zig-zagged or turned-under edge of your hem, pointing towards the bottom of the hem. Once you have your pins in place, it is time to fold your fabric in such a way as to make your blind hem stay as subtle as possible. With the wrong side of your fabric still facing upwards, flip the hem underneath the fabric, so that only the very small 2mm (1/12″) edge of the hem not caught by your pins is visible. If it helps you to visualise this step better, start by taking the head of your pins and whilst keeping the pins firmly in the fabric, flip the point of the pin under the fabric so that the head of the pin is now facing away from you as in the right-most pins in the picture above. Your fabric should now look as above. 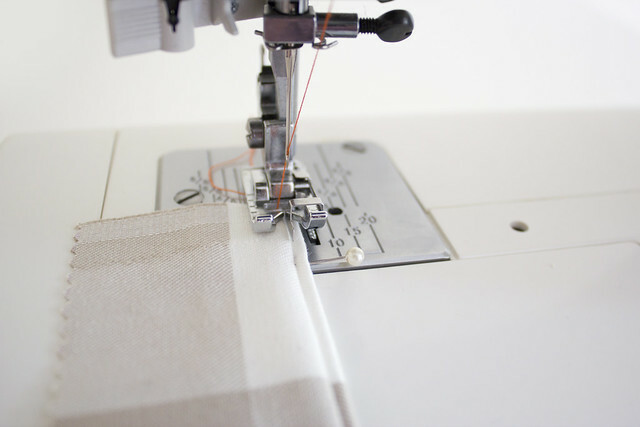 Keeping your fabric with the wrong side facing upwards, take it to your sewing machine and turn it so that the pins are facing to the right before placing it under the foot of your machine. 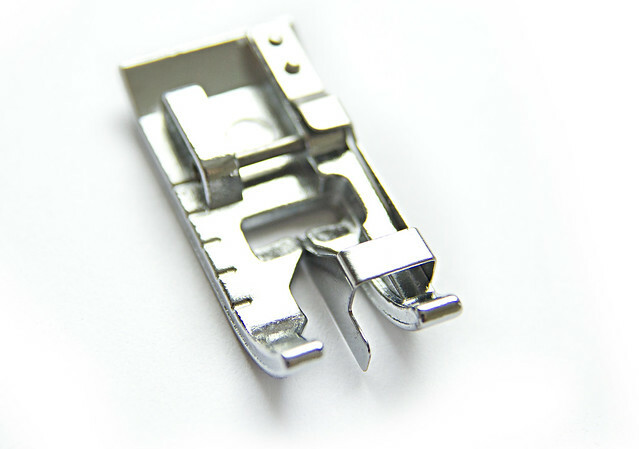 The vertical ‘blade’ of your sewing machine foot should act as a guide for the upper-most fold of your fabric to run along, to ensure that you do not sew the running stitch through the visible part of your hem. I have threaded my machine here with a dark orange thread because although we are looking for as subtle a result as possible, I still want you to be able to see what the sewing machine is doing, so I’m trying to make the stitches as visible as possible for the purposes of the tutorial. 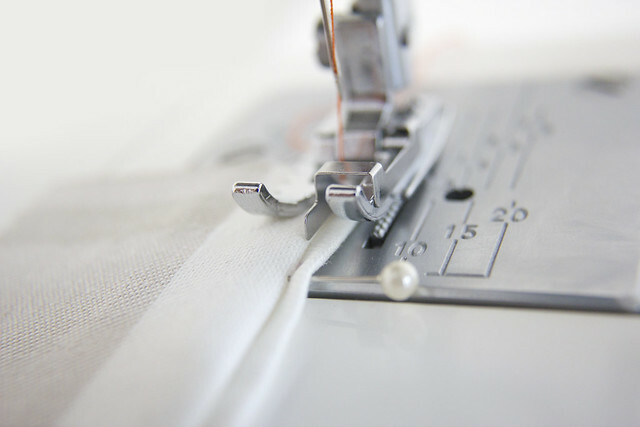 Secure your stitches by sewing backwards and forwards a few stitches at the beginning of your stitch line and then sew along your hem, keeping the blade-like vertical piece of your sewing machine foot butted up against the upper fold of your hem. 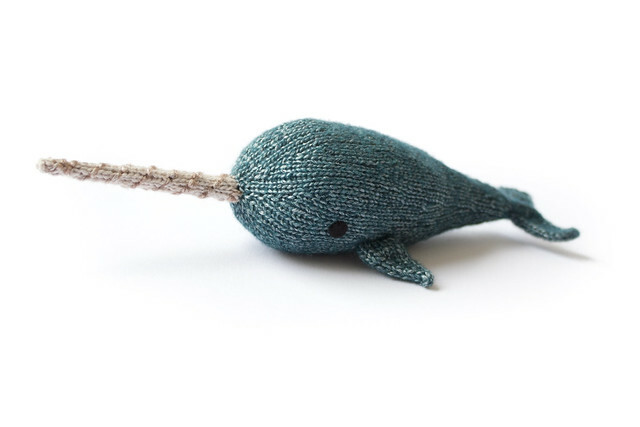 You should be sewing with a line of running stitches on the small folded piece of fabric to the right, with a single stitch jumping over to the left hand side every few stitches. Only this one stitch that jumps over to the left should go through the fold of fabric to the left of the centre of the sewing machine foot. It will be particularly important to ensure that the running stitches do not pass through the fabric on the left if you are not using a blind hem foot, so take it slowly if you need to. Remove any pins as you reach them by pulling them out to the right to avoid sewing over them. Sew to the end of your hem and back-stitch a few stitches to secure your work. Your finished stitching should look like the image above (except hopefully you will have used a far more suitable thread than I have). If you flip the fabric over to the right side it will look like the picture below, where you can clearly see that single stitch that every so often jumps down into the hem. Unfold your fabric to reveal the finished hem and to see what that line of stitches looks like from the right side of the fabric. Those occasional stitches have just inserted a small single tack at a regular interval to secure the hem in place. The stitches are small and subtle, and the effect is even easier to appreciate once you have ironed the fabric. The thread colour in the above pictures was especially selected to show these stitches off as much as possible to help with the recognition of what the stitch could do. If you have chosen a thread colour that is a little more suitable for your fabric then the resulting stitches in the hem should be very subtle. One tip that might be useful is that I have noticed that it seems to be beneficial (on my machine, at least) to loosen off the top-thread tension a notch or two when using this stitch on heavy weight fabrics such as curtaining, as it helps to prevent the fabric pulling on a too-tight stitch once the hem lays flat. Though I will still always appreciate the completely visible results I can get with a fine blind hem when sewing by hand, for large projects such as curtains this is a fine, neat and quick machine-sewn solution which I shall definitely be using in the future. A great tutorial. 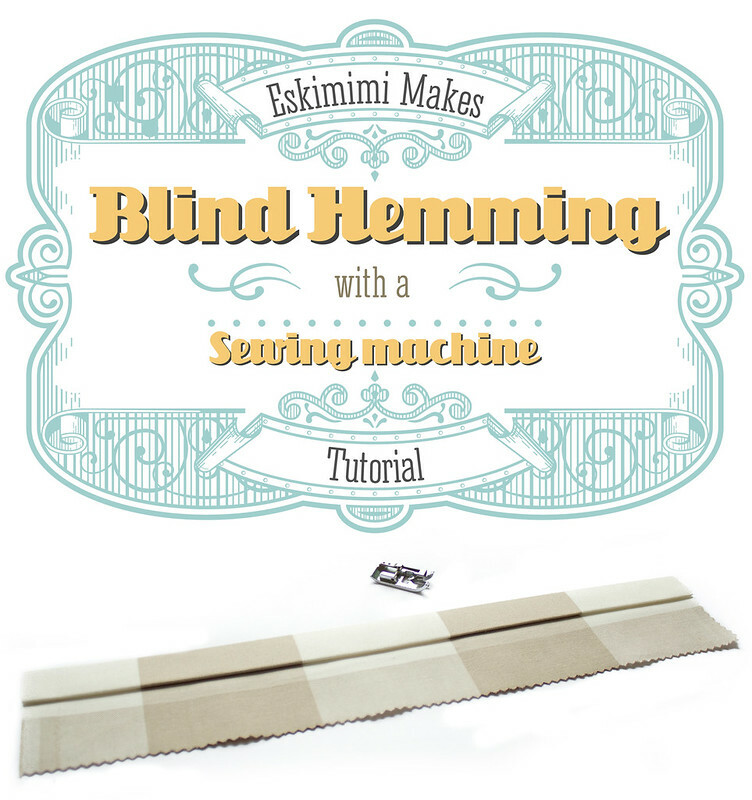 I’ve just seen a craftsy clip about blind hemming but having you explain it too has helped to lodge it in my brain. No more hand sewing school trousers up for me!! This is so helpful, thanks a lot ! I don’t currently have a sewing machine, but this will help so much once I do! Great tutorial! I totally understand what you mean by the blind hemming with a machine having a counter-intuitive procedure. I have to concentrate very hard still to make sure I get the fabric folded in the right way etc. The blind hemming stitch on the machine was a revelation to me. Being short, I have always needed to adjust the hems on skirts and I am clumsy with a hand needle. I did not know that there was a specific blind hem foot for the machine though. You have explained it well. I am wondering whether I have such a foot but didn’t realise that I could use it for blind hemming. Thank you for such a useful tutorial. Proper photos with explanation make more sense than sketchy diagrams in a basic machine manual.